When I think of a Ravens game (which I don’t often do), I imagine 40-somethings adding Budweiser to their beer guts around a grill in the stadium parking lot, or some guy covered in purple paint beating his chest. I’ve always considered football, like baseball and any other sport short of field hockey or dressage, largely a man’s game – for both the players and the fans. Some part of me knew that was stupid, but it wasn’t until today, when I went onto this new website bmorechix.com, that that bit of ignorance was fully slapped out of me. Go Earth! We Made It to Mars Again! Woooh, we did it! Woooooooh! NASA’s new Mars rover, Curiosity (much of which was built here in Maryland) made history early Monday morning when it successfully landed on the red planet. NASA is calling it the “most elaborate and difficult feat in the annals of robotic spaceflight,” the Baltimore Sun reports. It’s also way cool how they landed the rover. Once the rocket had gotten into the atmosphere, the entry craft broke off and began the descent, which worked in five stages summarized after the jump. Sounds like somebody took that book Choke a little too close to heart: police recently released a warning about a seizure-faking restaurant scammer in the Baltimore area. Andrew Palmer (pictured above) has just gotten out of prison and unless he’s made some major life-adjustments, restaurants had better be on the lookout for the 45-year-old. The red planet will get a little less lonely this Monday when Mars rovers Spirit and Opportunity are joined by Curiosity. She’s NASA’s newest, largest, and most advanced rover yet, and one of her most important parts was put together in Maryland’s Goddard Space Flight Center. Apparently a $74.6 million renovation wasn’t good enough for the Baltimore Aquarium – now they want to do another one. This week, Aquarium officials announced a planned $12.5 million coral reef exhibit, the beginning of a long-term rejuvenation project for one of the city’s biggest attractions. These fish-loving chumps just can’t get enough, can they? My job at Safeway basically consists of signing people up for the company’s mobile app (which is called Just for U and is awesome and if you shop there you should totally sign up for it). Safeway’s pretty proud of itself for the app – when I was getting briefed on it my manager told me how it was one of the first of its kind, how Safeway has the largest digital coupon center in the world, all that. It really is a good program, but I’ve got some news for Safeway: you’re not the only ones going mobile. Right now, all over the country, farmers have been turning to mobile apps to save time and money, and to increase communication with consumers. 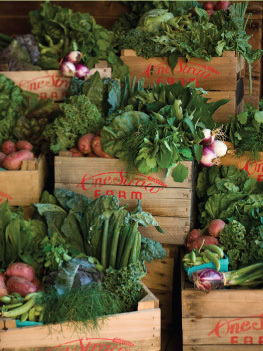 This isn’t just the Safeway’s and the Dole’s out there – it’s farmers market, local-produce types using technology to level the playing field, even if ever so slightly, against agribusiness. A home in Gambrills County reminded everyone that Baltimore City isn’t the only place in Maryland where police can make a major drug/weapon bust. On Friday the 27th, Anne Arundel County police found $50,000 worth of marijuana and two-dozen firearms in the house of one Nicholas Vincent Dominick. Friday night’s going to be a wild one. It’ll kick off at the Current Space Lot and end at some ungodly hour in the Floristree. 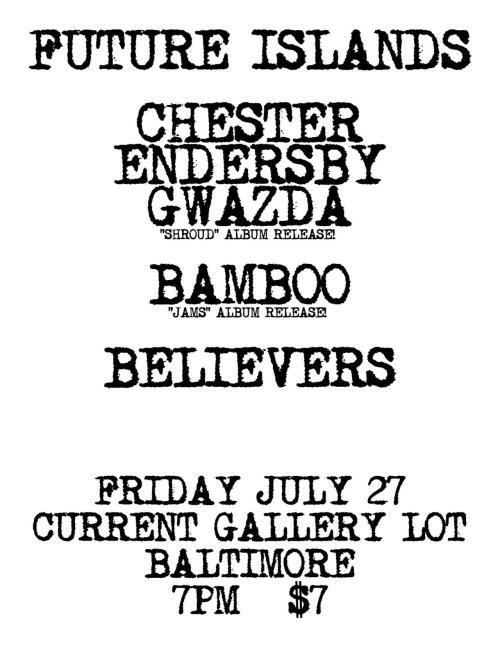 Current is holding a double-album release party for Chester Endersby Gwazda and Bamboo. And if that isn’t exciting enough, Future Islands and Believers are playing there too. For all you foodies out there, it’s Restaurant Week in Baltimore. This is Baltimore’s seventh Restaurant Week, today through August 5, and with almost 100 participating restaurants, it’s one of the city’s biggest. I wrote earlier about some of the problems with our prison system – that we try to solve crime by punishing it, rather than focusing on ways to prevent it. The zero-tolerance program in Maryland’s schools, which punished students regardless of extenuating circumstances, suffers from analogous issues. But that’s about to change.